The Chowkidar Hall of Fame, launched Friday, by Prime Minister Narendra Modi has caught the BJP by storm. Most BJP members of Modi’s 75-member Council of Ministers, as well as BJP MPs, have latched on to the #MainBhiChowkidar hashtag and added the ‘chowkidar’ prefix to their Twitter handles. Interestingly, the five NDA ministers in Modi’s government, as well as other allies outside, have been spared the ‘chowkidar’ enforcement drive. It’s a measure of their importance in their respective states. So, food minister and Lok Janshakti Party ally in Bihar Ram Vilas Paswan, heavy industries minister and Shiv Sena ally in Maharashtra Anant Geete, food processing minister and Akali Dal ally in Punjab Harsimrat Kaur Badal, junior minister for social justice and Republican Party of India ally in Maharashtra Ramdas Athawale and junior health minister and Apna Dal ally in Uttar Pradesh Anupriya Patel can still carry on with their social media interactions as if nothing happened. It seems PM Modi himself decided that the ‘chowkidar’ prefix would be the necessary social media weapon to counter Congress president Rahul Gandhi’s repeated taunt that Modi was mixed up badly in the Rafale fighter jet deal and therefore, could not be trusted to run the country. ‘Chowkidar, chor hai,” Gandhi has said from every pulpit these last few months. Surprisingly, Modi has taken the bait. 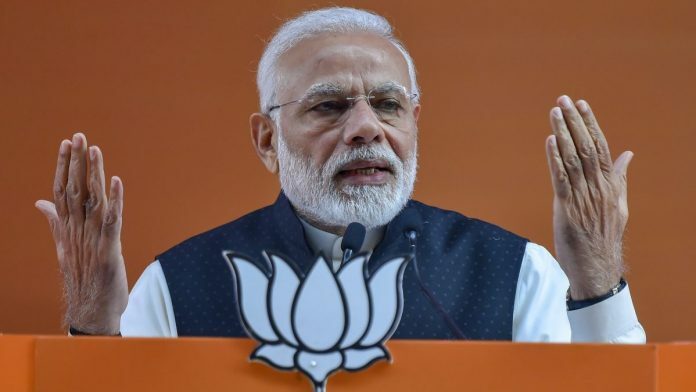 Although the IAF Balakot strikes in February reversed a great deal of the damage caused by the continuing impact of demonetisation, lack of corporate investment and the terrible jobs market, Gandhi’s jibe seems to have hit home with Modi. Considering Gandhi has offered little proof to his Rafale deal accusations, persists with a weak alternative narrative to Modi’s politics and has pulled out his sister Priyanka Gandhi Vadra from the woodwork in what amounts to a ‘too little, too late’ manoeuver, the fact that Modi is using a missile to counter the irritating noise in his ear is odd. Seems Gandhi has been able to get under his skin. Modi seemingly took little time to decide that his entire party would go public with the ‘Chowkidar’ Twitter handles. Unity in unity, it was felt. The BJP sent advisories to all ministers and MPs to follow suit. A few like home minister Rajnath Singh took a full day to join the battle. Only one BJP leader continued to resist till Tuesday morning — days after Modi went public with his ‘chowkidar’ drive. Junior external affairs minister and former army chief V.K. Singh, already infamous for his “presstitute” comment made early on in Modi’s tenure as a disparagement of the press, had refused to fall in line. Perhaps he felt Generals cannot become ‘chowkidars’, presumably because the latter are too low in the food chain and he couldn’t be seen to rub shoulders with them? The other two remaining BJP ministers S.S. Ahluwalia and Ramesh Jigajinagi are barely on social media, which perhaps explains why the ‘chowkidar’ fever hasn’t caught up with them. Even M.J. Akbar, who was stripped from the junior external affairs portfolio because of his alleged involvement in the #MeToo sexual harassment campaign, has valiantly changed his Twitter handle to keep in tune with changing times. By then, the “Main Bhi Chowkidar” video, set to crooning music, had already been launched by the BJP. Only days before, finance minister Arun Jaitley had unveiled the BJP campaign’s main slogan for 2019 on Facebook: Modi Hai Toh Mumkin Hai. And a few day before that, the government had launched its own campaign, showcasing five years of the Modi government’s achievements, called: Na Mumkin Ab Mumkin Hai. Certainly, the last five years have been peppered with Narendra Modi videos. The party and the government have spent large sums to bring slickly produced messages to the people. Modi hasn’t hesitated in telling us how he exercises or even how much he wants to wish women on International Women’s Day. But the ‘Mumkin hai’ videos have an incredible similarity. The first is a party slogan, the second is a government hashtag. But two of the five words in both slogans, ‘Mumkin hai’, are common. The attempt to merge the party with the prime minister is certainly deliberate. Old-timers recall the good old days in 2014, when the ‘Abki baar, Modi sarkar’ poll slogan was given by adman Piyush Pandey – notwithstanding the claims of Spice Jet chief Ajay Singh or JD(U) vice-president Prashant Kishor (then part of Modi’s media strategy), media entrepreneur Rajesh Jain or Arvind Gupta (today chairman of MyGov) – and how it encapsulated the hopes and aspirations of the times. This time around, catchphrases such as ‘Modi phir se’ or ‘Phir ek baar/Modi sarkar’ were bandied around, but the Modi campaign wanted something newer, something fresher. Something that gave you the flavour of what has been, someone with the determination to carry on the good work of the last five years. ‘Modi hai to mumkin hai’ won the day. At last, the battle has been joined. The first votes will come in a few days from now. Soon, all these campaign videos and slogans will fall silent. And Narendra Damodardas Modi will be tested by the people. At least BSY should have been exempted.